Madhya Pradesh recorded nearly one-third of tiger deaths in the country in 2016, according to National Tiger Conservation Authority (NTCA) data. Of 97 tiger deaths reported in the country in 2016, the highest since 2001, 30 were from Madhya Pradesh. This is nearly three-fold increase in the tiger mortality in the state compared to 2015 (when 11 tigers had died) and highest in the state in the past one decade.According to wildlife group CLAW (Conservation Lenses and Wildlife), there were 102 tiger deaths in the country in 2016, including 33 from Madhya Pradesh.According to the report prepared by CLAW, there has been 145% higher tiger deaths in the country compared to last year. The report said out of the 102 tiger deaths, 35 were due to unnatural reasons, 43 due to natural and details were awaited in 24 cases. 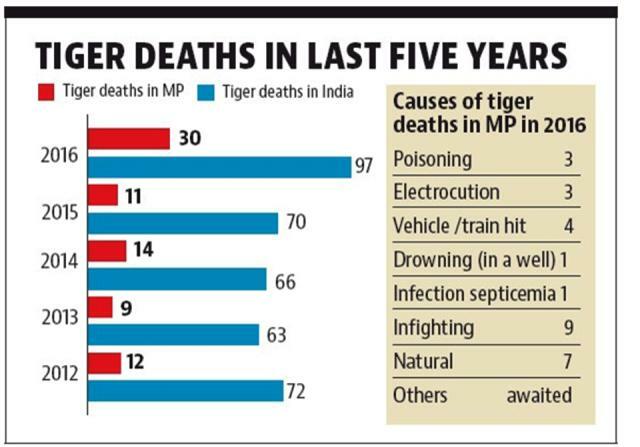 In Madhya Pradesh, tigers died due to various reasons, ranging from poisoning, electrocution, drowning, poaching, infighting to natural deaths.The report also pointed out that 27.4% of deaths was in age bracket of 1 month to 3years,30.39% in age bracket of 4 -9 years and 19.6% of more than 10 years. In Madhya Pradesh, tigers died due to various reasons, ranging from poisoning, electrocution, drowning, poaching, infighting to natural deaths. 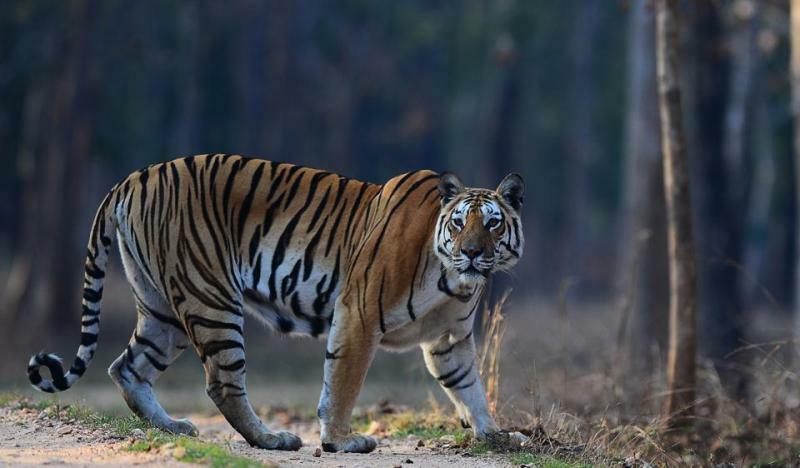 The report showed 11 tigers died each in Pench and Kanha while Bandhavgarh Tiger Reserves reported seven deaths.This unprecedented tiger mortality is worrying the wildlife lovers and officials. Wildlife activist Ajay Dubey said the wildlife department can’t disassociated it from the fact that many tigers died due to poisoning, electrocution and poaching.